The purpose of the visit was to express progress in the industrial supply chain that will help to enable the deployment of directed energy lasers. Considering the vital role Lasertel plays in directed energy systems, as the direct diode pump source of choice, Lasertel spoke about the deployment of these lasers in the battlefield. In continued support, Goings's visit to congress was followed by a congressional visit to Lasertel at the end of last month. 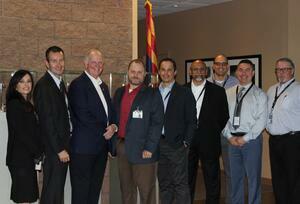 Congressmen Tom O’Halleran of the 1st Congressional District of Arizona is pictured here, visiting the headquarters in Tucson on Tuesday, October 23. If you have questions regarding diodes for laser systems, contact us today! Interested in learning more? Lasertel has developed a library of customer resources, including multiple educational white papers on directed energy technology.